Nassau, Bahamas: It started with a victory at home in the Japan Open. It ended with another trophy in the Bahamas against a short but strong field. The way Hideki Matsuyama is playing, he might wish the Masters started next week. "I'm kind of glad it's not," he said with a broad smile, "because I don't think I could win next week." Winning must be exhausting for the 24-year-old Japanese star, and no one has been more proficient at it over the last two months. Even more alarming is that Matsuyama is making it look easy, although getting through the final nine holes at the Hero World Challenge felt as heavy as walking through the beach sand of the Bahamas. Coming off seven-shot victories in the HSBC Champions and the Taiheiyo Masters, he had a seven-shot lead over Henrik Stenson going into the final round at Albany Golf Club. Matsuyama didn't make another birdie after the ninth hole, and his lead was reduced to two shots with two holes to play when he closed with two pars for a 1-over 73 and a two-shot victory. "I can't say that I played well today," he said. "But I did win Tiger's tournament, and what a great honor it is." 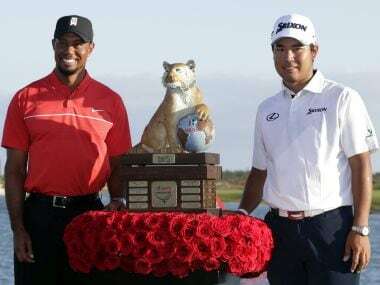 Matsuyama said Tiger Woods has been his golfing idol as long as he can remember, and as much as he enjoyed winning, he was just as happy to see Woods back in competition. Woods led the field with 24 birdies, but six double bogeys contributed to a 15th-place finish in the 17-man field. 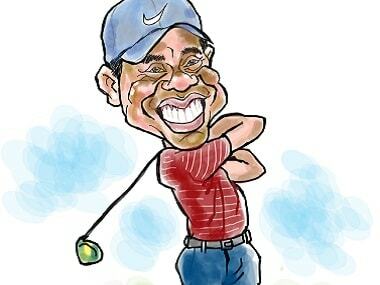 The first time he heard of Woods was when Matsuyama was five and watched video — "over and over and over again," he said — of Woods winning the 1997 Masters. Three years later, Woods won 10 times around the world, including the final three majors in what is considered his best season. "Unfortunately, I wasn't able to see all those wins because they didn't have the broadcast in Japan," Matsuyama said. "But I knew Tiger was winning, and I knew he was very good. And I almost expected him to win every tournament." Perhaps he is starting to appreciate what it's like to get on a roll. "I'm not even close to being mentioned in the same sentence as Tiger," he said. "But I am working hard, and hopefully, little by little, I'll get better and better." Matsuyama isn't the first player to get on a hot streak. Last year, Jason Day won four out of six tournaments against the strongest competition in the world, including the PGA Championship and a pair of FedEx Cup playoff events. Matsuyama now has 12 victories worldwide, and while he became the first Asian to win a World Golf Championships title, a major is where players are measured. "You've got to do it in the big events in the summer, too," Woods said. "So it's going to give him a boat load of confidence going into next year and he's going to be one of the top guys to beat for a very long time. Look at his swing, look at his game and look at the body that he has. It's built to handle the test of time." Matsuyama hasn't finished out of the top five since the Tour Championship, and while he can't explain why he keeps winning, this recent run likely dates to the Deutsche Bank Championship. It was there that Hiroshi Iwata suggested a drill for his putting, which has held Matsuyama back. Iwata introduced him to the "Pelz Putting Tutor," a small metal plate with two tiny steel balls at the end that are set apart just over the width of a golf ball. It is designed to help players line up putts and with their stroke. Iwata's drill is to make 10 short putts in a row with a conventional grip, using only the left hand and only the right hand. Perhaps it helped this week that Matsuyama's caddie, Daisuke Shindo, wanted the week off. So he borrowed Iwata's caddie, Mei Inui. Not only does she know the drill, she managed to keep Matsuyama calm when his lead was slipping away. "When things get tough, I sometimes put my head down and become quiet," he said. "But Mei was always positive throughout, even the back nine, and was giving me good vibes, which really helped coming in." Matsuyama, who now lives primarily in Orlando, Florida, is headed home for Japan to spend time with his family. He's worked hard. He's won plenty. He could probably use a break, but it won't be for long. He wants to keep this going into the new year, which starts 5 January in Hawaii. And he's already thinking about the Masters. "I think he'll be a major champion within the next couple of years, personally," Jordan Spieth said. "It's awesome to see him tearing it up here."